Not sure if you're STILL running Windows XP? AmIRunningXP.com to the rescue! 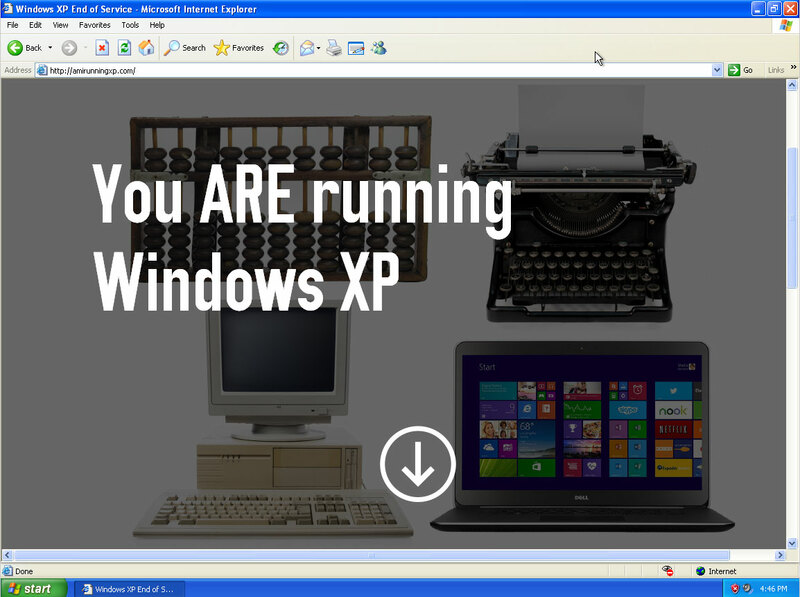 If you're wondering who is still running Windows XP in this day and age, given that support for the OS is ending soon, the answer is it might be YOU! Or at least, so Microsoft suspects. But fear not: Redmond has stepped up its outreach program with a new website that's designed to get to the bottom of this mystery, once and for all. Those blissfully ignorant souls who haven't the foggiest clue what OS their PCs might be running can now wing on over to AmIRunningXP.com and get a straight-shooting, no-nonsense answer to the question that has been confounding them. If you're all clear, then rest easy. Other than a gentle hint to make sure you've moved all the way up to Windows 8.1, the site has nothing much to say to you. If XP is detected, on the other hand – SHOCK, HORROR! – the site alerts you to the presence of the offending OS in great, big letters, superimposed over images of similarly outmoded items, including an abacus and a typewriter. 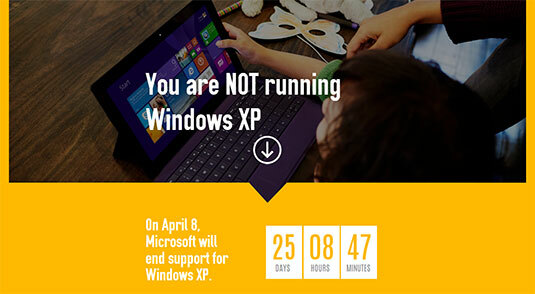 "Windows XP is a 12 year old operating system," the site scolds. "Now is the time to upgrade to a new device running Windows 8.1 for a safe and secure PC experience." Lest you assume the whole thing is some kind of practical joke, The Reg did some sniffing around. A WHOIS search of the domain reveals that it was registered at GoDaddy to one Kristina Libby of Seattle, Washington on February 26, 2014. A LinkedIn profile for Libby reveals that she is a Global Consumer PR Lead at Microsoft. A few more searches reveals that AmIRunningXP.com is just one of several tools that Microsoft has created to alert customer's to the impending end of XP support. Another is a free program developed in partnership with Laplink that can move data from our XP systems to our new Windows PCs. Or wait ... do I even have an XP system? Hold on just a minute ... errrrr ... right. OK. Good. Although we suspect AmIRunningXP.com is a little tongue-in-cheek humor, it reminds some here at Vulture Annex of the BeOS operating system call is_computer_on() (returns 1 if the computer is turned on, undefined result if not) and, even better, is_computer_on_fire() (returns the temperature of the motherboard if the computer is on fire. If the computer isn't on fire, the function returns some other value).